Military Curfews, Firebombings, Airstrikes & Shattered Peace Deal: Is Turkey on Brink of Civil War? | Democracy Now! Military Curfews, Firebombings, Airstrikes & Shattered Peace Deal: Is Turkey on Brink of Civil War? associate professor of political theory at Bogazici University in Istanbul, Turkey. On Thursday evening, she helped organize a demonstration at Columbia University in solidarity with the Kurds in Turkey and against the Turkish government attack. Gambetti co-edited the books The Kurdish Issue in Turkey: A Spatial Perspective and Rhetorics of Insecurity: Belonging and Violence in the Neoliberal Era. member of the HDP Party Assembly. The leader of Turkey’s Peoples’ Democratic Party (HDP) has accused Turkey’s rulers of pushing the country toward civil war ahead of November’s elections. Over the past week, over 100 offices of the opposition HDP have been attacked. Many were set ablaze. The office of the independent newspaper, Hurriyet, was also attacked in Istanbul. Meanwhile, the predominantly Kurdish city of Cizre remains under 24-hour military curfew. Residents report facing a humanitarian crisis with food and water shortages. Tensions in Turkey have escalated since June, when the ruling AKP party lost its parliamentary majority in a major defeat for President Recep Tayyip Erdogan. In July, Turkey began an air campaign against camps run by the outlawed Kurdistan Workers’ Party (PKK) in northern Iraq. The fighting has shattered a peace process launched to end a conflict that has killed more than 40,000 people since 1984. NERMEEN SHAIKH: We turn now to Turkey, where a leading opposition political party has accused Turkey’s rulers of pushing the country toward civil war ahead of November’s elections. Over the past week, over a hundred offices of the opposition HDP, or Peoples’ Democratic Party, have been attacked. Many were set ablaze. The office of the independent newspaper Hurriyet was also attacked in Istanbul. Meanwhile, the predominantly Kurdish city of Cizre remains under 24-hour military curfew. Residents report facing a humanitarian crisis with food and water shortages. Phone lines have also been cut to the city, and the media has been blocked access. Opposition politicians, who have been stopped from reaching the city, have accused Turkish security forces of having a shoot-to-kill policy. Local residents say 21 civilians have died. Turkish authorities have disputed that claim, saying 30 militants had been killed in the city. 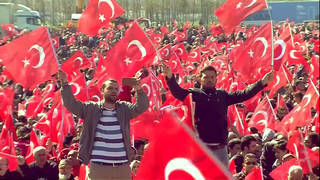 AMY GOODMAN: Tensions in Turkey have escalated since June, when the ruling AKP party lost its parliamentary majority in a major defeat for President Recep Tayyip Erdogan. The opposition HDP party won 13 percent of the vote, securing seats in Parliament for the first time. Since the elections, hostilities between Turkish security forces and Kurdish militants have sharply escalated. Hundreds of people have been killed, including dozens of security personnel, in attacks by the PKK, or Kurdistan Workers’ Party. In July, Turkey began an air campaign against camps run by the PKK in northern Iraq. The fighting shattered a peace process launched to end a conflict that’s killed more than 40,000 people since 1984. To talk more about Turkey, we’re going to turn to several guests. In Istanbul, we’re joined by Ayse Berktay, a member of the HDP Party Assembly. Here in New York, we’re joined by Zeynep Gambetti, an associate professor of political theory at Bogazici University in Istanbul, Turkey. On Thursday evening, she helped organize a demonstration at Columbia University here in New York in solidarity with the Kurds in Turkey and against the Turkish government attack. Gambetti co-edited the books The Kurdish Issue in Turkey: A Spatial Perspective and Rhetorics of Insecurity: Belonging and Violence in the Neoliberal Era. Welcome to Democracy Now! It’s great to have you with us, Professor. AMY GOODMAN: Start off by explaining, for people who hardly even know where Turkey is, what is happening right now, how serious this is. AMY GOODMAN: Since the elections. ZEYNEP GAMBETTI: Since the elections, that brought in the HDP, which is a party that grouped different forces together, so it’s not just a Kurdish party, it represents those who—those groups, ethnic groups, but also social groups, the LGBT, the workers, the Alevi, the Armenians, that didn’t have a voice in Parliament. It actually did win 13 percentage of the vote and had 80 deputies in Parliament, which changed the whole arithmetics in Parliament, which means the AKP lost its majority. And what happened is, according to the constitution, the party with the most votes should have gone on a round of negotiations with other parties to form a coalition government. What the prime minister of the AKP didn’t do, Davutoglu didn’t do, was actually take these negotiations seriously and offer real chances for the other parties to get together to form the coalition. And after 45 days, the president, President Erdogan, actually called for new elections. So, we don’t have a government. There’s no stability. And in the meantime, what happened also was that the AKP called off the peace process, which was a very difficult one, which was going on for years between the Kurdish separatist militants and the government. The PKK, which is the guerrilla organization, the Kurdish guerrilla organization, also decided to sort of take up arms and began to hit army and police positions. So the armed conflict is escalating now. NERMEEN SHAIKH: Well, I’d like to bring in Ayse Berktay. She joins us from Istanbul. She is a Party Assembly member of the opposition HDP. So, Ayse, could you talk about what the situation is there in Istanbul, what you hear of the news in Cizre, the besieged city that HDP politicians have been prevented from entering, and the fact that HDP remains associated with the PKK, the Kurdistan Workers’ Party, which is, of course, according to the Turkish government, as well as the U.S. government, a, quote, “terrorist” organization? AYSE BERKTAY: Hello. Thanks for this opportunity to let us have our voice heard in other parts of the world. We need it very much, especially in these days. If we start from Cizre, what’s happening in Cizre, it’s—the news—I couldn’t let cellphone—you know, I kept holding it in my hand, and friends here had to say, “Just put it away.” It’s because just everything happens every minute in Cizre. And since the 4th of September, it’s under curfew. Plus, it’s not just curfew, it’s under siege. There is an iron-and-steel siege of tanks and military carriers and special operation teams around the city, blocking all entry and departure from the city, any and all. And even they cut off the intercity road that passes by the city. So there are—you know, there’s a whole line of thousands of cars. At times, they let it open for one hour, and everybody rushes along to the other cities passing by the highway. There is curfew. And the penalty, normal penalty, for curfew and breaking the curfew is you’ll have to pay a 100-euro fine. But here in Cizre, you get shot. You have snipers and armed carriers all around the city, but they are blocked from entering the neighborhoods, the streets, the narrow streets of the neighborhoods. They cannot go in there. They want to go in there. And the people are keeping them out of there because they know once they get in, it will be a massacre. So they put snipers. Cizre is a city down—it’s a mountainous area around it. And the snipers are located in the minarets of the mosques. No longer we have the call to prayer from mosques in Cizre. There are snipers located in the minarets and around the hills and on tall buildings around these neighborhoods. AMY GOODMAN: I wanted to go to Professor Zeynep Gambetti for one minute and ask you about the significance of Cizre, just to place it. We’re talking about southeastern Turkey, and it’s located at the border of Syria just to the northwest of the Turkish-Syrian-Iraqi tripoint, where they all come together. ZEYNEP GAMBETTI: Yes, that’s right. AMY GOODMAN: So the significance of this, why this siege is happening in Cizre? And are there attacks on HDP offices around Turkey, as well? ZEYNEP GAMBETTI: Yes, of course. And I was going to say that before Cizre, there were several other towns that have been sieged, in the same way, but—like Silvan. But they stayed under siege for three days, whereas Cizre now is in the eighth day, the siege is in the eighth day. Well, it is situated in a very strategic point, and it is sort of on the route of the passage toward Syria and Iraq of the Kurdish population, and also of medical teams, peace workers, of those in support of Kobani, which is an independent region that the Kurds have saved from the hands of ISIS and Syria, and where they’re practicing, basically, a more or less autonomous government. So it is in a very strategic point. AMY GOODMAN: And I wanted to ask Ayse Berktay in Istanbul—you’re a member of the HDP. Can you explain what it is? Because it is not just a party of Kurds. Explain how it came together. We only have about a minute. NERMEEN SHAIKH: We only—Ayse, we only have a minute, and I’d like to ask Zeynep—we only have a minute. NERMEEN SHAIKH: I’d like to ask Zeynep very quickly, before we conclude, how Turkey’s anti-terror laws have been used by the Erdogan government in the present crisis, and, very quickly, what the Kurdish role in fighting the Islamic State in Syria and Iraq, how that’s played a role in how Erdogan is responding internally. AMY GOODMAN: Very quickly, we have 30 seconds. ZEYNEP GAMBETTI: Very short, the anti-terror laws were more draconian than the PATRIOT Act that was promulgated in the U.S. I mean, so, it actually, basically, criminalizes opposition and criminalizes critique, criminalizes demonstration. So they can be used in very bad ways. And secondly, your question concerning—what was it again? NERMEEN SHAIKH: The Kurdish, the Kurdish role in fighting the Islamic State. ZEYNEP GAMBETTI: In fighting the Islamic State, the Kurds are—actually, the Kurds that are affiliated with the PKK, and not those that are affiliated with the federal Kurdish government in Iraq, are doing a very good job. And they’re the only ones who are holding out against the ISIS in Syria. They are the ones who have experienced fighting Syria. And the U.S. knows that, actually, I mean, that they need these Kurds to confront ISIS. AMY GOODMAN: Well, we will certainly continue to follow this story. Professor Zeynep Gambetti of Bogazici University in Istanbul, joining us here, and Ayse Berktay, thank you for being with us from Istanbul, a member of the HDP Party Assembly. This is Democracy Now! We’ll be back in a minute.